The month of May is over and it’s time for the monthly collection of posts from May. We have some wonderful collection of posts from the last month. 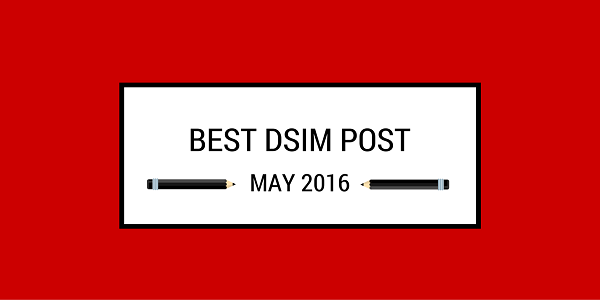 There were many posts on our blog from which we have selected top 10 most read blog post to mention here. Let’s check out what is inside! Case study includes the brief description of the journey of the brand including its growth and success story. CricBuzz and TripAdvisor were the most read this month. CASE STUDY: How CricBuzz leveraged Social media with TV ad Campaign to make it a huge success? CASE STUDY: How TripAdvisor became world’s largest online travel portal using SEO marketing? These startup has attracted the eyes of the readers this month and being the most read article we have taken Care on Go and Truejodi as top read startup this month. DSIM Startup of the Week “CareOnGo”: How CareOnGo is becoming one stop solution for all your health needs? DSIM startup of the week “Truejodi”: How Truejodi is filling the loophole in the matrimonial sites? Most number of the companies got funding in between 9 May to 15 May. Have a look to know more about the funding received. These news all rolled over social media for the whole month of May. These are the most read news article from our blog related to digital industry. [su_box title=”More From DSIM” box_color=”#c7c7c7″ title_color=”#000000″ radius=”5″]1) STARTUP: How CareOnGo is becoming one stop solution for all your health needs?